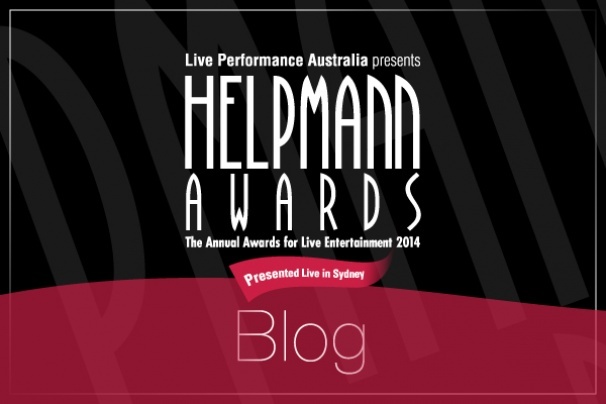 Watch this space for the 2014 Helpmann Awards Blog! Ready to cast off at 7.30 tonight Monday 18 August at The Capitol Theatre Sydney! An incredible start to the 2014 Helpmann Awards with a majestic opening from Disney's the Lion King, previous Winner of 4 Helpmann Awards, including Best Musical! Robyn Nevin, an absolute legend of Australian theatre, a well-deserved winner. "sometimes you light it and nothing happens" according to Robert Grubb, but not in the case of the amazing nominees for lighting design. Djuki Mala performing an incredibly unique take on Singing in the Rain in AFL footy shorts. Great to see 2 former Prime Ministers supporting the arts. The Ring Cycle is such a challenging work, it's a great testament to our industry to have great performances of this piece in Australia. And now it has been celebrated by multiple Helpmann Awards, congratulations to all involved. The Special Event Award is a special category for events that contribute to our live performance industry in a unique and important way. Vivid Sydney is a worthy winner. 1.4million attendees, Lauren Hill, light shows - a true festival of music and ideas. Helpmann's fun fact: James Reyne of our iconic Oz pub rock band, Australian Crawl, was actually born in Nigeria. Thanks Wikipedia. Bruce! Described by Michael Gudinski as "a religion". Congratulations to all those involved in the tour. Bluesfest was great this year, congratulations to Peter Noble and his team. A great win for regional arts. Kelley Abbey's pink dress is amazing - brightening the rainy Sydney evening. The cast of Strictly Ballroom The Musical giving an inspired performance. Giving us all hope that the man-bolero will come back into fashion. Sue Nattrass, former head of the LPA, presenting her eponymous award for the first time. A great moment. Patricia Boggs gets a standing ovation. So much love in the room. Pat Boggs: "how lucky can you be? A beautiful award, from a beautiful lady... And a full house!" Another win for the Melbourne Ring Cycle, congratulations! The Zephyr Quartet playing a haunting evocation of poem by Mike Ladd about a trip to Central Australia. A uniquely Australian take on classical music, sparse and beautiful. Fantastic to see a Tasmania company win this a prestigious award. The Helpmann's truly represent the breadth of our industry across Australia. We are so excited to have Lou Diamond Phillips perform with "our" Lisa McCune. It's Young Guns meets Water Rats! An absolutely magical performance of the much-loved musical. John Frost, Director of the Gordon Frost Organisation has had an illustrious career and he is celebrated tonight at Australia's premier live performance awards. Julie Andrews gives a fantastic and hilarious tribute. He thanks Pat Boggs, our Sue Nattrass Award winner tonight, demonstrating her amazing influence on the industry. Congratulations Windmill, our children's theatre is breaking ground in Australia and overseas. The In Memorium is always incredibly moving. Ths year is no exception. Jonathan Biggins thanks Vannessa Scammell and the Helpmann's orchestra for their wonderful work tonight. We concur! "Two of the best things to happen to Australian stage: John Robertson and Nancye Hayes" presenters for the evening. Congratulations for stage and screen star Craig McLachlan for his performance in Rocky Horror for the cult classic's 40th year anniversary. Congratulations to Verity Hunt-Ballard in an incredible field of amazing women. Helen Dallimore's dress is stunning! Richard Roxburgh wins for STC's Waiting for Godot. Thanks Andrew Upton for "running zero to Beckett in 10 seconds". Best Female Actor in a Play had an INCREDIBLE list of nominees, congratulations to Cate Blanchett and STC. It's great to see Pamela Rabe in a less intimidating role than Joan on Foxtel's fantastic Prisoner remake "Wentworth". We still feel like she might put the winners in solitary! Geofferey Rush has won an Academy Award, A Tony and an Emmy. And here he is at the Helpmann's. Presenting to Belvoir - congratulations!! Lou Diamond Phillips and Verity Hunt-Ballard in a wonderful mix of very-long-nice-compound-names presenting the final Awards. And ending with Les Mis. What a wonderful representation of our industry tonight! Congratulations to all and we hope to have a glass of champagne with all the winners and nominees... and most importantly, the fans. The Awards represented the influence and importance of live performance in Australia. Thanks and goodnight!